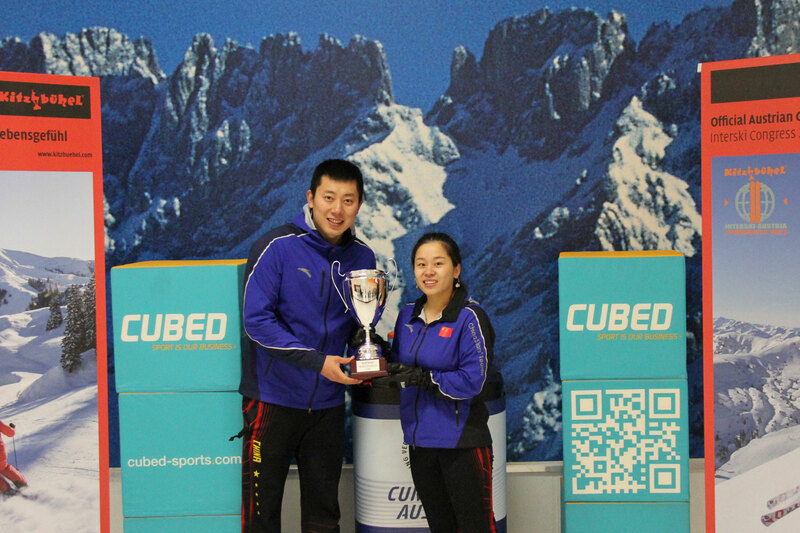 Rui Wang/Dexin Ba (Harbin, China) wins the WCT Austrian Mixed Doubles Cup, defeating Nadja Grunder/Peter Hartmann (Thurgau, Switzerland) 7-4 at the ISS World Mixed Doubles Curling Tour event hosted by the Kitzbühel Curling Club in Kitzbühel, Austria. Wang/Ba take home the $1,188CDN first place cheque, while Grunder/Hartmann receives $891CDN and 0.000 world ranking points for their second place finish. Starting with hammer, Wang/Ba scored 2 in the first end, then Grunder/Hartmann responded in the second end scoring 3. Wang/Ba scored a single in the third end, added a steal of 2 in the fourth end, steals in the fifth and sixth ends to take 7-3 lead. Grunder/Hartmann scored a single in the seventh end but fell short as Wang/Ba held on for the 7-4 win. In the semifinals, Wang/Ba defeated Zuzana Hajkova/Tomas Paul (Prague, Czech Republic) 6-5 and Grunder/Hartmann defeated Lisa Menard/Ray Baker (Dauphin, Canada) 9-4. Hajkova/Paul won $594CDN, while Menard/Baker won $446CDN for their third and fourth place finishes. In the quarterfinals, Wang/Ba defeated Bernadett Biro/Otto Kalocsay (Budapest, Hungary) 12-4, Grunder/Hartmann defeated Jie Mei/Jingyuan Wang (Harbin, China) 11-5, while Hajkova/Paul defeated Michelle Gribi/Reto Gribi (Biel, Switzerland) 9-8 and Menard/Baker defeated Jenny Perret/Martis Rios (Glarus, Swizerland) 7-5. Perret/Rios, Mei/Wang, Biro/Kaloscsay and Gribi/Gribi earned $260CDN for their quarterfinal finishes. Wang/Ba went 3-0 in the 16 team round-robin pools qualifying round. In their opening game, Wang defeated Eniko Szabo/Balasz Foti (Budapest, Hungary) 16-0, won against Menard/Baker 7-5, and Daniela Matulovina/Milan Moravcik (Bratislava, Slovakia) 12-4 in their final qualifying round match.